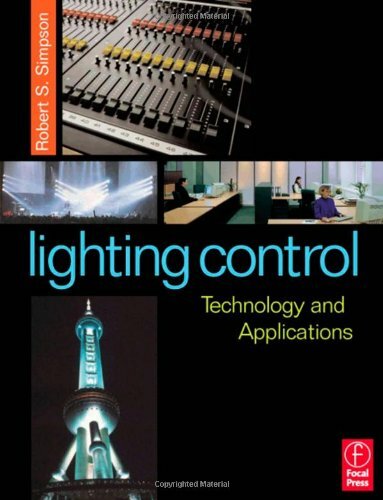 Robert Simpson's comprehensive volume covers all aspects of lighting control systems. It starts with two foundation chapters outlining the basics of electricity, light and electronics as they apply to lighting control. It then reviews all current artificial lightsources, and comments on their suitability for control. A section on lighting control components covers electronic and electromagnetic dimmers, ballasts and transformers. The next section reviews lighting control systems, including those for stage and entertainment, architectural applications, energy management and building control; and includes a chapter on control signals protocols. The final part is an extensive applications review, fully illustrated, covering everything from hotels and cruise ships to homes and churches; and taking in offices, factories, simulators, trains and planes on the way. Lighting Control: technology and applications brings together information not otherwise available from a single source. It is intended as a training resource within the lighting industry, both for those completely new to the subject, and for those coming to it from another technical field. It will also be useful for lighting designers, consulting engineers and electrical contractors as a reference book covering current and emerging lighting control techniques - with special emphasis on new light sources and new digital control standards. Information, case histories and illustrations for the book have been provided by many leading lighting companies and organizations in North America and Europe. Robert Simpson has more than 40 years experience of lighting control systems and their application. He is a Director of Helvar, an international company specializing in the design and manufacture of lighting components and lighting control products. He is a member of IESNA, and a fellow of the BKSTS. He also Chairman of Electrosonic Ltd.